Nut plate drill countersinks are so named because they are used in nutplate pneumatic drill motors. These portable units incorporate nut plate drill jigs and the nutplate drill to drill consistent, properly drilled and counter sunk holes. These machine specific drills are used with nut plate jigs to produce a high volume of holes that are to size. 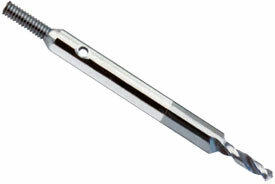 Nutplate drills easily start a hole in difficult to machine materials.